When I say it was the worst case of stage fright in the world, I’m not kidding. I’m describing myself. I was terrified when I first started public speaking. I don't want you to think it was a normal kind of fear, it wasn't. The most strange thing would happen. I would feel totally confident until I started walking to the room where I would speak. Then an absolutely paralyzing fear would come out of nowhere and take over my entire body. It was an unthinking reaction, completely out of my control. Back when I started, we wore silk blouses and business suits. When you sweat in silk, it makes a big dark mark on the silk. I could never take my suit jacket off because my sweat made that dark, ugly mark from my arm pit all the way down to my waist. I kid you not. You had to seriously wonder why on earth I wanted to become a public speaker because the amount of stress I experienced was almost beyond endurance. You might be thinking it went away after the first 5 minutes of speaking. I wish it were so. It took about 30 excruciating minutes. That kind of fear is totally obvious to an audience. Trust me, I know. The look of sympathy on their faces was piercingly painful. 30 minutes into my talk, it would go away and I was fine, charming, charismatic (okay, at least that's what they told me). The evaluations at the end of my talks were not pretty. I remember in my entire first year of public speaking, the nicest one I ever received was from someone who wrote, “I am sure that someday Ingrid will be a good trainer.” I wish I could find that person today and thank them for being so nice. I got a lot of advice from people. The advice fell into two camps. Half the people told me that if I just kept doing it I would get over my fear. The other half said it's not something you ever get over. You have to learn to live with it. I had one person tell me that you will always have butterflies in your stomach; the trick is to get them to fly in formation. Well, mine were certainly NOT butterflies. They were more like World War II bombers and, whether or not they flew in formation, they were dropping bombs right and left. There was no chance they would turn into butterflies. It's amazing I persisted. This stage fright lasted for the first 5 years of my career. I studied everything about stage fright I could get my hands on, read every book, had mentors, studied great speakers, rehearsed in front of a mirror, practiced until I dropped, tried every tip stopping short of medication. For 5 years there was no change to speak of. Some days and with certain groups it was microscopically better than others, but overall, it was paralyzing. People were shocked to see it because I sounded confident before the presentation and then they saw how different I was once the stage fright landed. I was determined to learn how to handle it. I was determined to be causative. I kept thinking there must be an answer. And I was determined to find it. What was happening was so IRRATIONAL that I just couldn’t accept that I had to deal with it, live with it, endure it forever. It paid off. I found the root cause. This turned out to be important. All the tips I’d gotten never addressed the root cause. There are THOUSANDS of tips put out to deal with the symptoms, none of them even mention a root cause. And none of them worked for me. When you Google, “how to handle stage fright”, you’ll find many strange suggestions, even from places like Stanford and Harvard. I saw a video posted by Stanford where the woman recommends wiggling your toes. She's got to be kidding! Wiggling my toes would've made me feel completely stupid. The Harvard video demonstrated “power poses” I should try. They made me look ridiculous. If you have stage fright, probably what you’ve been taught about it isn't true. If it were, you wouldn't have it. It turned out I was resisting the audience, not allowing myself to fully experience them. I couldn't even face them comfortably. It was really simple. I actually couldn’t perceive the audience, meaning literally I didn’t see them, they were gray shapes, not individual people with faces. I was so caught up with what was going on in my mind, I couldn't focus on them. My entire experience up there was MENTAL. It had nothing to do with the real world, with the audience in front of me. In short, I was not experiencing them. I was so loaded with RESISTANCE it paralyzed me. When I found the root cause, what to DO about it became obvious. I realized it was a SKILL SET to stop resisting, be comfortable in front of the audience, face them with ease, not feel judged, get my attention off myself, be fully in the moment and not anticipate their reactions or the outcome, to not be thrown off by the status or importance of the individuals in my audience, to perceive each person with clarity, to fully EXPERIENCE my audience and connect with EACH individual in the audience with complete ease. I created a series of practice repetitions to master each skill and then mastered them one at a time. It was not overwhelming because I practiced one skill at a time. I did these exercises and suddenly the stage fright was gone, ALL the stage fright was gone. I was able to come out, completely at ease and relaxed, and make an immediate connection with the audience, I was able to make my presentation really good from the first, “Hello." Soon after, I was asked to speak to a group of 500 CEOs. Normally I would have been sweating down to my ankles. I couldn't believe it. I walked out front, I was completely calm. I was even laughing about something that had just happened in the group. I made a very relaxed and spontaneous comment about it and then everyone was laughing too. We were completely connected. Right off the bat. I felt like a miracle had happened. I discovered the people who said I had to live with some degree of fright my whole life were, to put it baldly, wrong. You don't have to live with it. You can make ALL of it permanently gone. I also trained myself, very systematically, in all the other skills that would make me a great speaker. Now I’m in demand as a speaker and my evaluations are outstanding. People don't believe me when I tell them I had no natural ability for public speaking. They think I'm making it up. Personally I'm happy they don’t believe it, and even happier that videos of my early talks don't exist because they truly were more awful than I’m even portraying here. Whether anyone believes it or not, it's the truth. I had no natural abilities when it came to public speaking. Actually, that's not correct. Just like everyone else, I was loaded with natural abilities, but they were buried so deep inside of me, it took an archaeological expedition to get them out. Once I conquered stage fright, as I saw others present, I thought they could really benefit from what I learned. There's an incredible advantage I have PRECISELY because I started truly terrible at something and then learned how to become really good at it. It’s made me a GREAT teacher. The reason is, I know EXACTLY what it's like to not know how to do something. I know what it’s like to be terrified. I am easily in my students shoes looking at the world through their eyes, seeing what they see, feeling what they feel. And I know painstakingly well EACH of the steps, mastered little by little, one at a time, that are needed to learn how to become a polished expert at presenting to groups. I know each of the exact skills you need to master and in what sequence. So, I started to teach it and have done so for 30 years. I used what I discovered about the root cause of stage fright, plus the exercises I did to make it vanish, plus the exercises I did to master all the skills you need to be great, to form the core of a 2-day workshop I love to deliver. This particular workshop gives me inexpressible joy every single time I teach it. Over the years I learned how to take everything that took me well over 5 years to learn and hone it so I can teach it in 2 days and have EVERY student create an incredible transformation in the way they present. 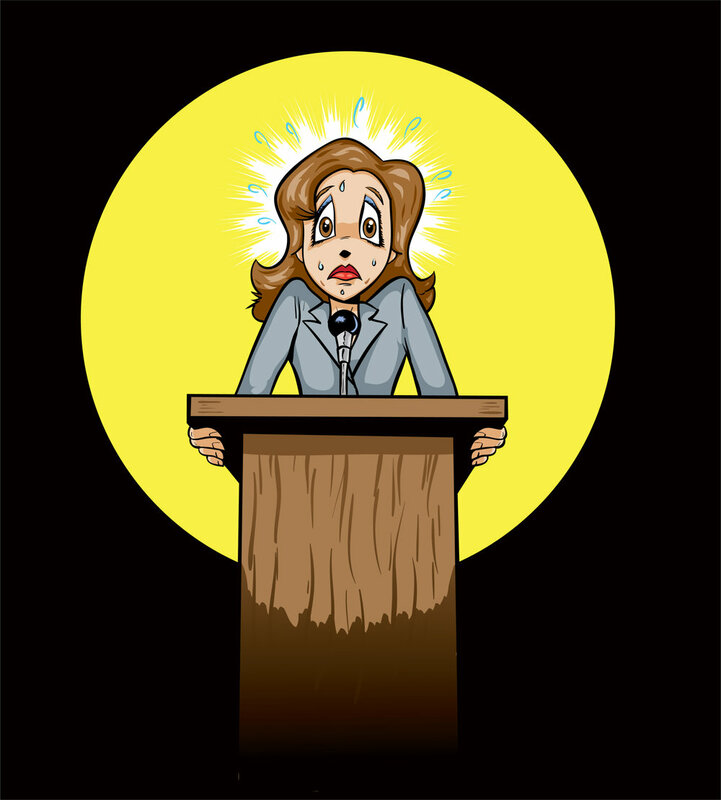 When I started teaching presentation skills, I discovered that just about EVERYBODY has some degree of stage fright. We all try to hide it, but it is astounding to me how prevalent it is. Not everyone has it as severely as I did, but many people do. I taught one woman who was seriously trying not to throw up before her presentations. I've had a number who take medication for it and don't want to. I've had many who are paralyzed by it, and an equal number who simply feel tense, not at ease or relaxed. I had one CEO who started not sleeping well the week before a big presentation, and I’ve taught many people who don't sleep well the night before. I’ve worked with a number of the world’s foremost experts in their field who are terrified when they have to communicate their knowledge in public. It’s CRAZY! How many people have it and how bad it can be. Many people do my workshop specifically because they have dreadful stage fright. I'm ridiculously delighted to work with them because I know the relief they're going to experience in the workshop and especially after when they get in front of an audience and experience being FREE of it. I tell them they will get over their stage fright by lunch on the first day. They never believe me of course, until it happens. The reason we tackle stage fright so quickly in the workshop is because I need them COMPLETELY comfortable and relaxed before I start teaching all of the other skills that will make them powerful presenters. “Five years ago I spoke to an audience. Suffering from a horrible bout of stage fright, I lost my place mid-speech. Flustered and scrambling, the audience had to clap me offstage. I was so disappointed with myself. I had practiced and practiced – what went wrong? “Last week I made my first presentation since that embarrassing event. I presented to an in-room audience of 150 of my peers, and a global televised audience of 250+. I was a success! I received comments that I was a “natural”, congratulatory emails from across the country, requests to be a mentor, and a huge accolade from my manager! Now I've trained thousands of people, many of them have won major speaker awards at conferences, some of them have an international fan club. All of them are powerful and amazing, even if they’re only presenting to small groups of engineers. Because I learned the skills the hard way, I know how to make it easy for everyone else. So I can't even begin to tell you how thrilled I am that I can teach something that helps so many people. It’s a joy to teach. And I’m so proud that my staff do just as good a job as I do when they’re teaching it. I'm always blown away seeing their work. So are their students. It really is a teachable skill. Handling stage fright is just the BEGINNING of a beautiful journey to becoming an incredible public speaker, where you totally connect with your audience, where it’s so good, you can’t stop grinning. I hope my own experience helps you with your own stage fright. I WISH I could make your stage fright vanish! I wish I could do justice teaching you how to make it evaporate in this blog. I’ve never learned how to write about it so someone can learn how to make it go away completely. I’d love to be able to do that. Right now, it's something you need to be in person with me to learn fully. I teach it in a workshop format because I need to have you in person for 2 days to do the exercises and we need to have an audience in front of you. That way I can really truly demonstrate each of the principles and skills to you. You can practice the new skills with an audience in front of you and I can coach you to make sure you're doing it right. As you do the exercises, you EXPERIENCE the stage fright vanishing and you see exactly what you’re doing to make it go away. You also see exactly what you need to do to prevent it from coming back. You gain control.